Oil Electric and gas-mechanical cars. All photographs Jim Parker Collection unless otherwise credited. 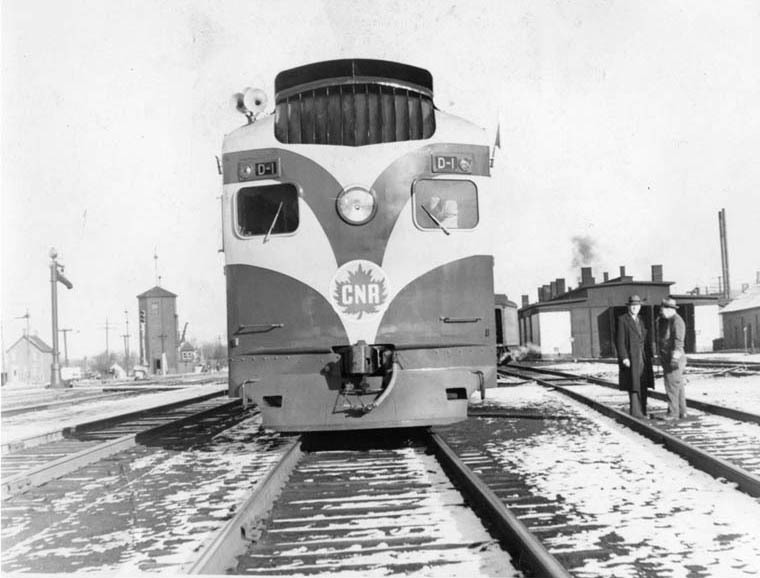 Like many railways the CNR sought to reduce operating costs for its lesser passenger trains especially those on branchlines. Late in 1923 a CNR official visited William Beardmore and Company in Glasgow, Scotland where airship motors were being tested and it was agreed they could be adapted for railway use. 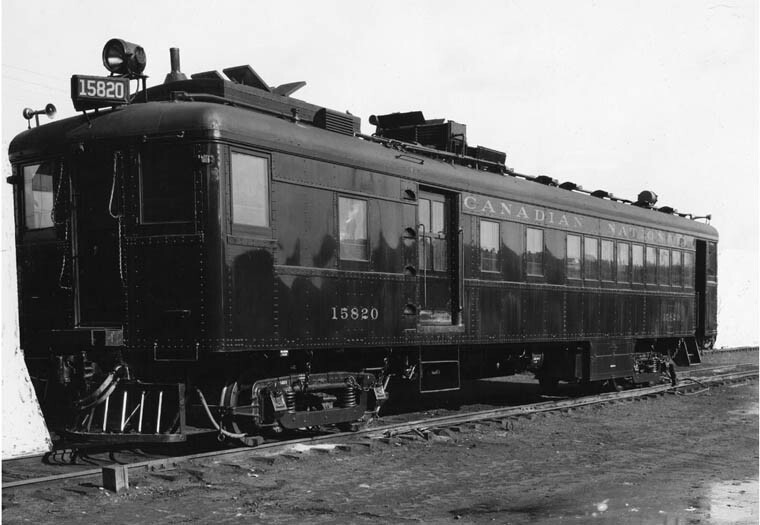 Beginning in 1925 CNR took delivery of a number of self-propelled diesel-electric cars assembled by their Pointe St. Charles Shops in Montreal using these Beardmore diesels (4 cylinder, 185 hp), Ottawa Car Manufacturing Co. bodies, National Steel Car trucks and Westinghouse Electric traction motors. 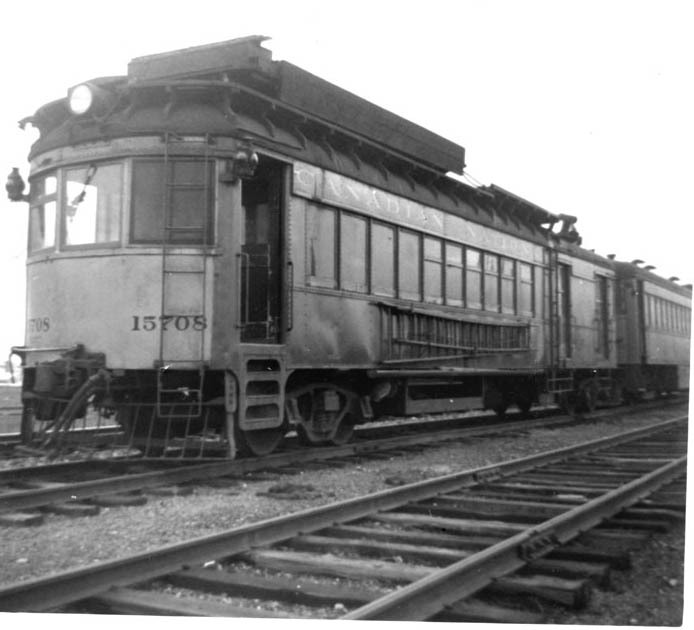 The first car delivered in August 1925 was 15819 a 60 foot double-ended car that began service on September 21st. 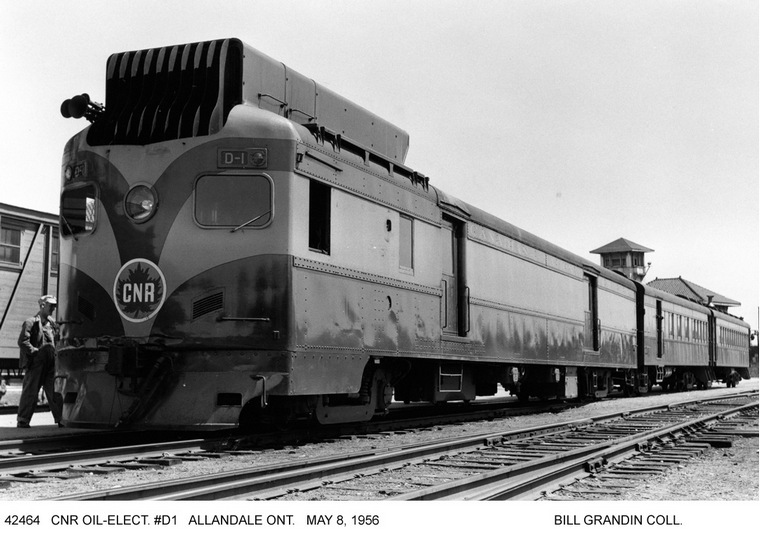 between Hamilton-Guelph-Galt-Brantford. 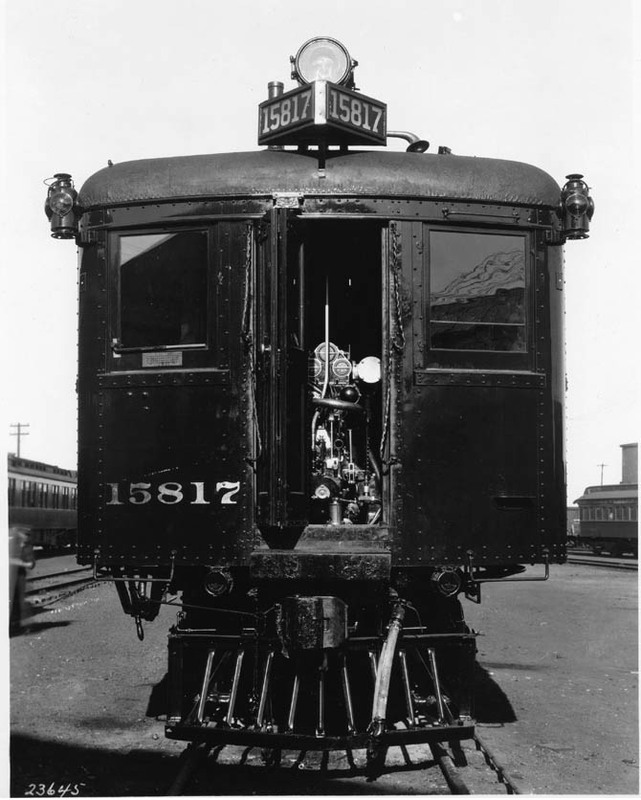 The first articulated car was 15817 which began operation September 18th. Montreal-Hawkesbury-Ottawa. 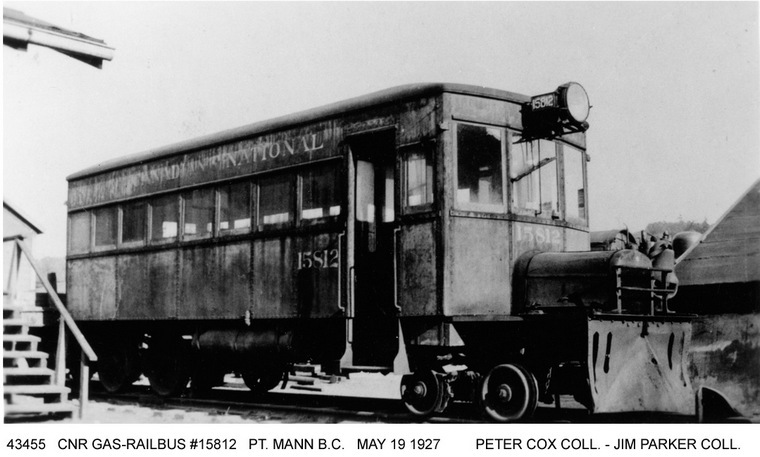 A month later it was replaced by 15818 and reassigned to Guelph-Southhampton service. The next car 15820 was destined for Western Canada and beginning November 1st it made a record breaking run 2,937 miles to Vancouver. Following this epic run it ran back to Edmonton where it took up service on trains 77 and 78 between Edmonton and Vermillion covering 129.8 miles Daily Except Sunday. 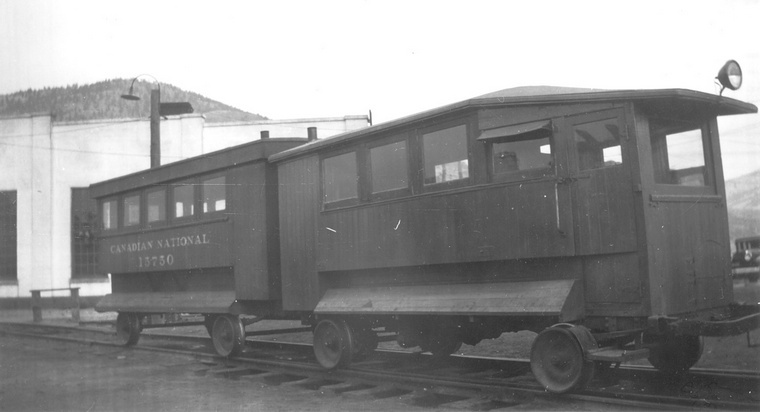 Five more similar cars were delivered in 1927 following which five bigger cars (15826-30) 73 feet long double-ended with 6 cyl. 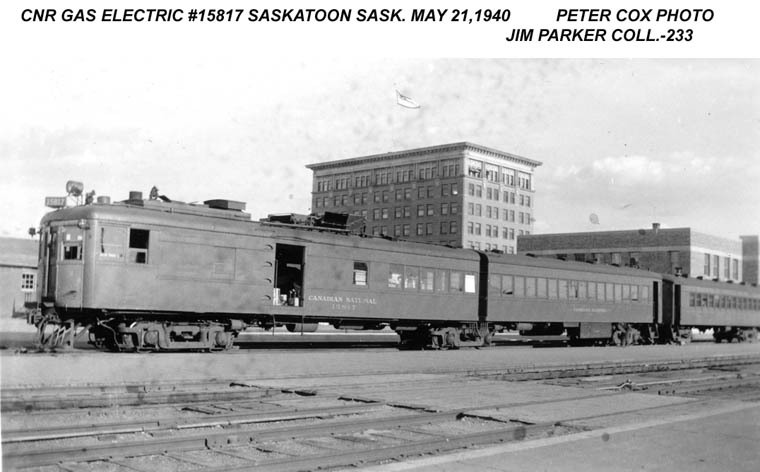 300 hp Beardmore diesel engines were also built in 1927. 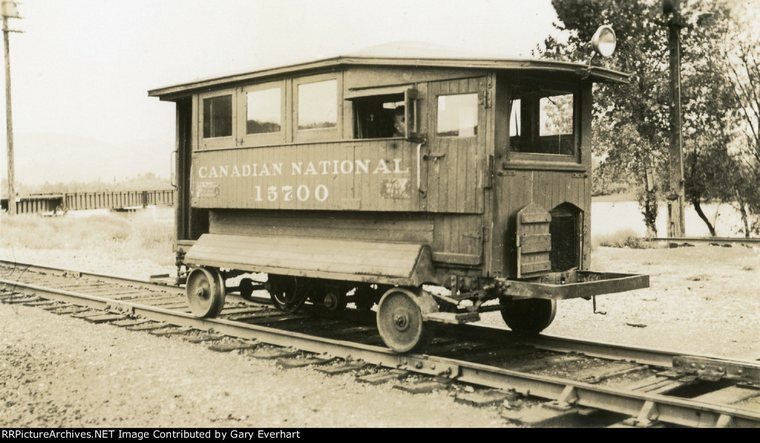 There were now 30 self-propelled cars of various sorts and in the year they operated nearly 2 million miles! 15750 trails un-numbered unlettered unit used on employee shuttle. 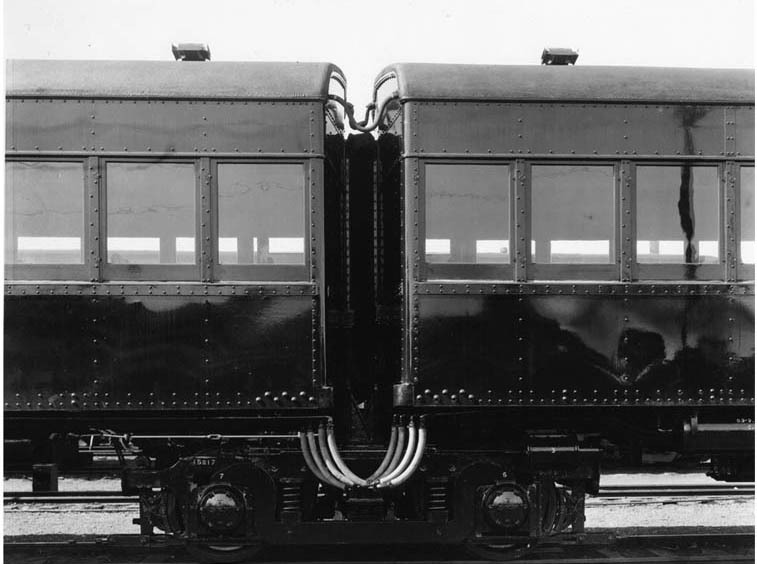 Motors M-1 and M-2 built Fort Rouge shops 1919-1920 Re# 15700, 15701 late 1921. Ford T 4-cyl. gas engine carries 10 passengers. 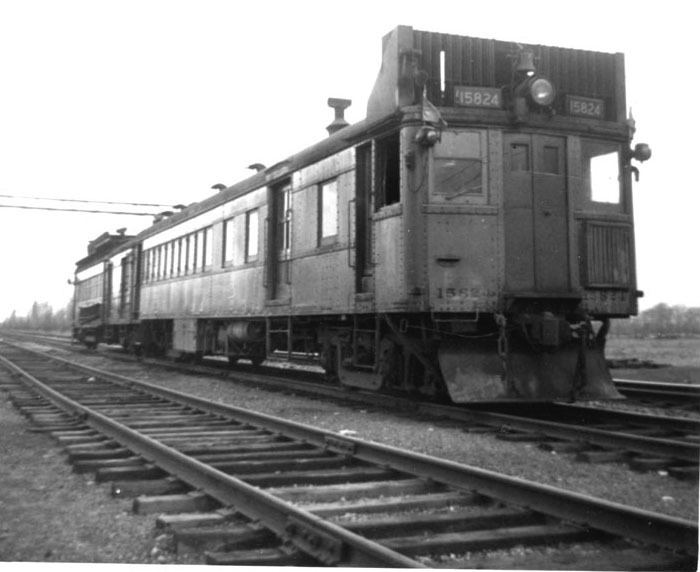 Trailers T-1 and T-2 renumbered 15750, 15751. Kamloops October 17, 1940 Unknown credit. 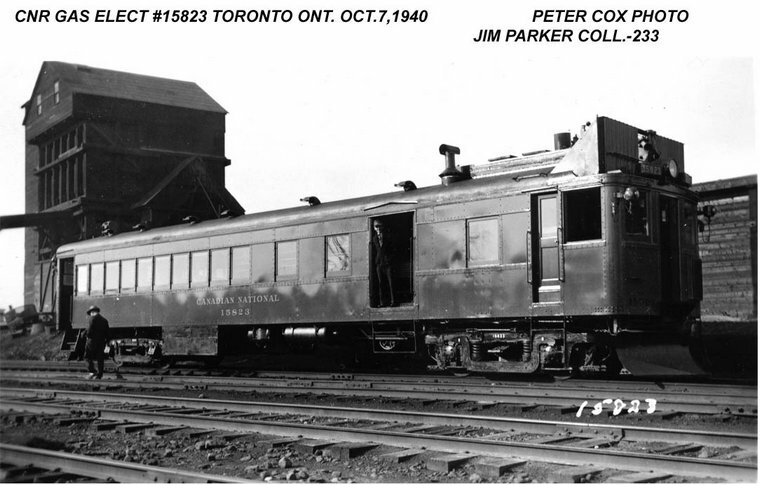 Shown here as Lakeshore Model Railroad Association club car next to Mimico yard on dead track in Toronto. 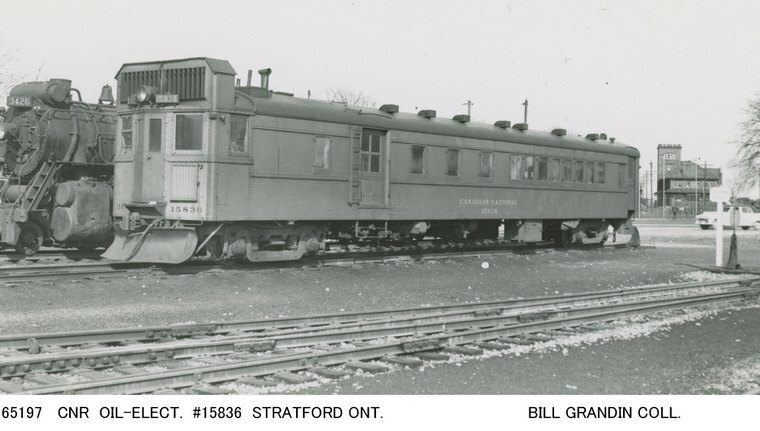 15804 Brill model 55 seats 40 Built October 1929. 15810 Brill 4-cyl. 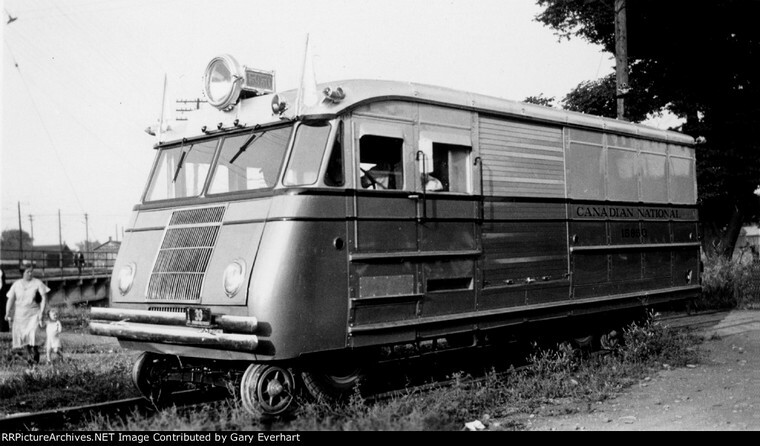 gas-mechanical model 55 built by Ottawa Car 1925 15 tons 43 feet 38 passengers. Used on employee shuttle two miles between Kamloops and Kamloops Junction. 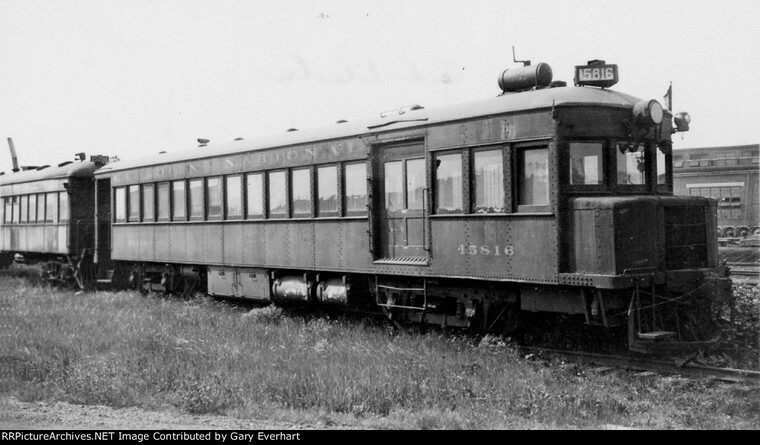 15816 Built National Steel Car 11/1923 Sterling 6 cyl. gas engine. 54 feet long, 32 seats. Toronto 6/10/1936. 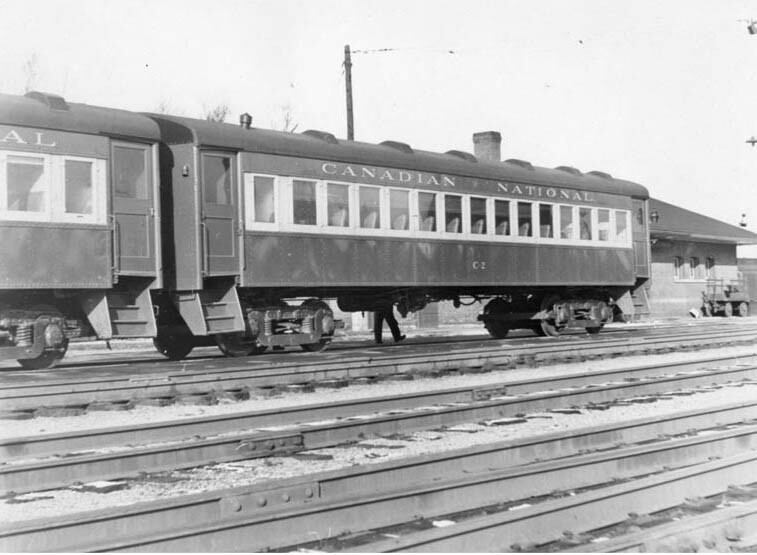 Note: This car was ordered by Grand Trunk but was taken over by CNR prior to delivery. 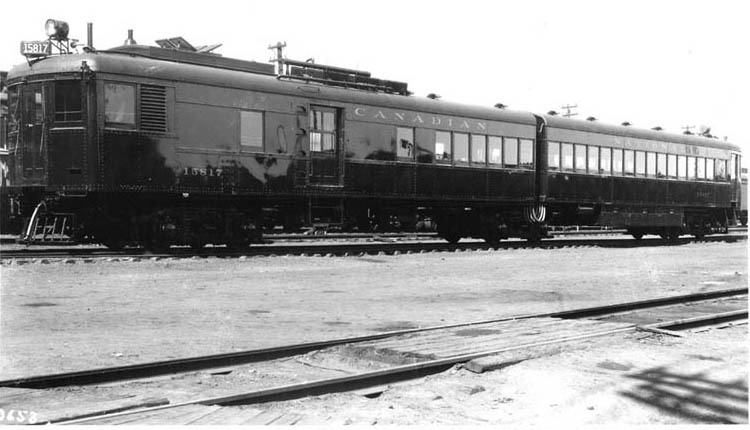 It was said to be the most powerful self-propelled car in North America at the time. 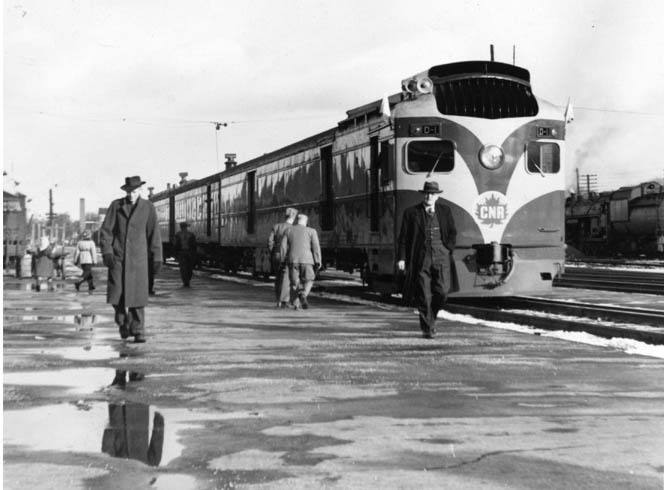 In November 1923 it began service between Toronto and Hamilton. 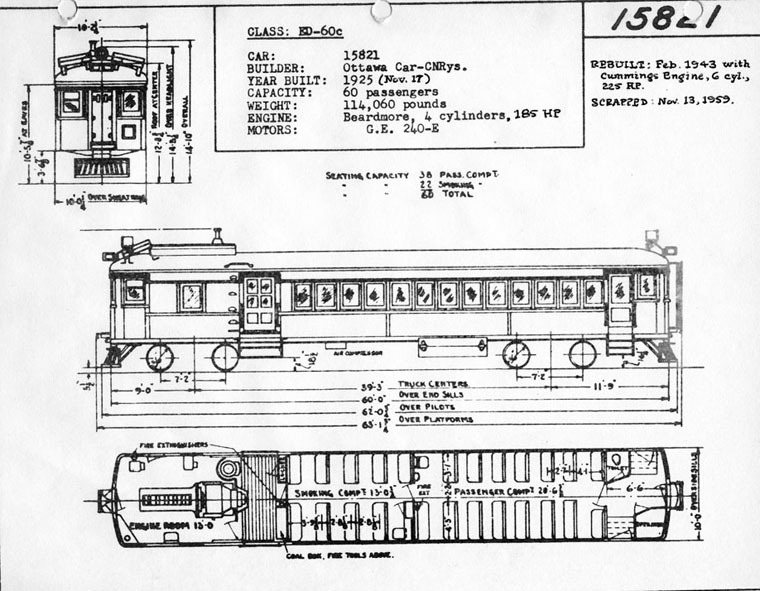 15708 rebuilt 7/1926 as tower car, rebuilt 8/1946 as trailer. .
15826 diagram shows small passenger compartment seating 22 passengers plus 18 in baggage compartment. Motor Train 603 has arrived in Midland at the end of its run from Lindsay in a light snowfall. Passengers have detrained and new ones entrained for the return trip while express is handled by the contractor A.C.Mc.Nabb Phone 136 Midland. 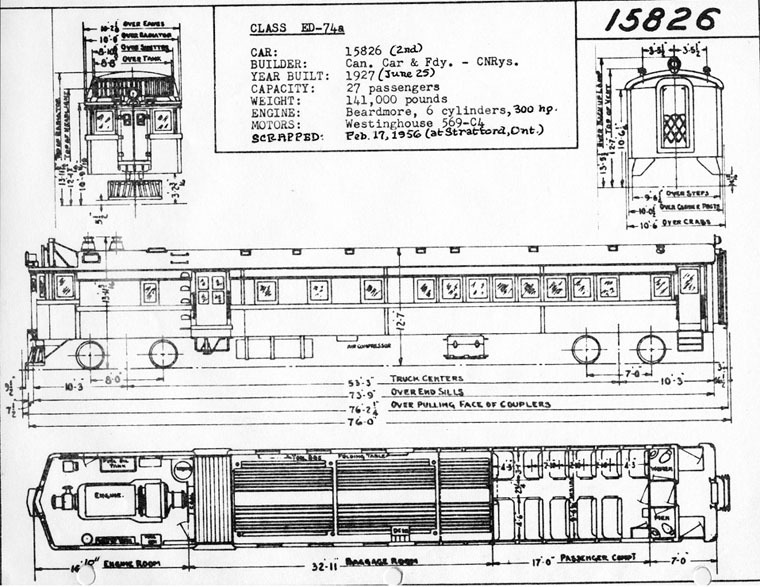 15832 is a 74 foot CC&F combination car with a 27' 3" baggage compartment and a 22' 8" 37 seat passenger compartment. Built in 7/1930 and equipped with a Westinghouse 6 cyl. 350 hp diesel and two Westinghouse 215 hp traction motors. Also, Peter Smith hot water heater. Holding 275 gallons of fuel. Weight 70 tons. 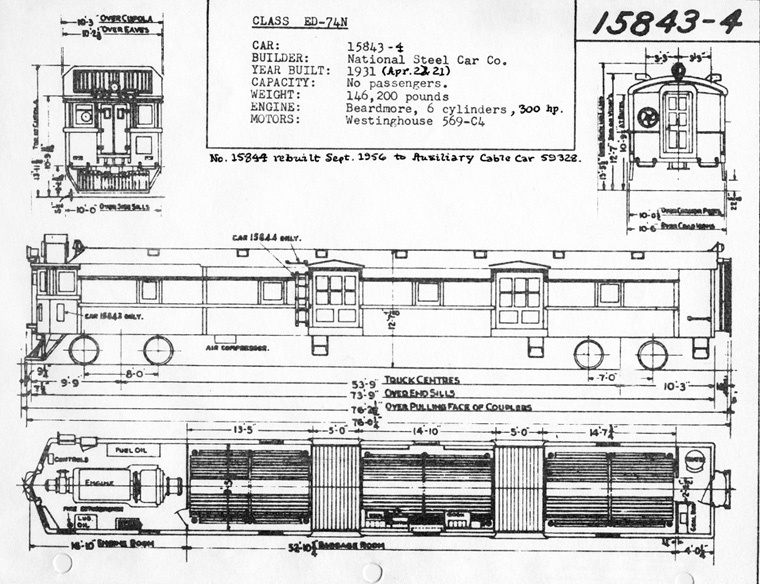 Note: Diagram of 18526 (above) also applies to 15832. Note: Following its retirement 15832 was converted in 1960 for work service as Auxiliary Cable Car 60026 (unpowered) as were others. 15767 is a 51 foot 29 ton combine with RPO mail section and 22 seat passenger compartment. Built by Brill 22411 1926 as CVR 151 all-baggage lightweight trailer. 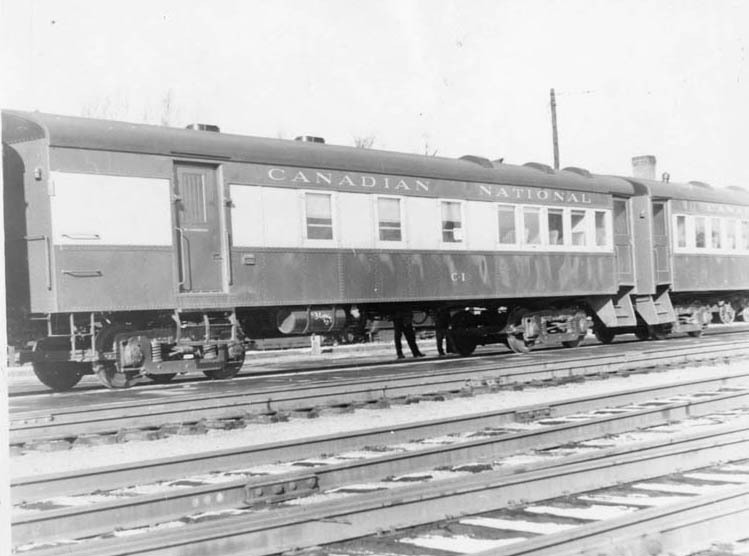 Converted 1941 by CNR. 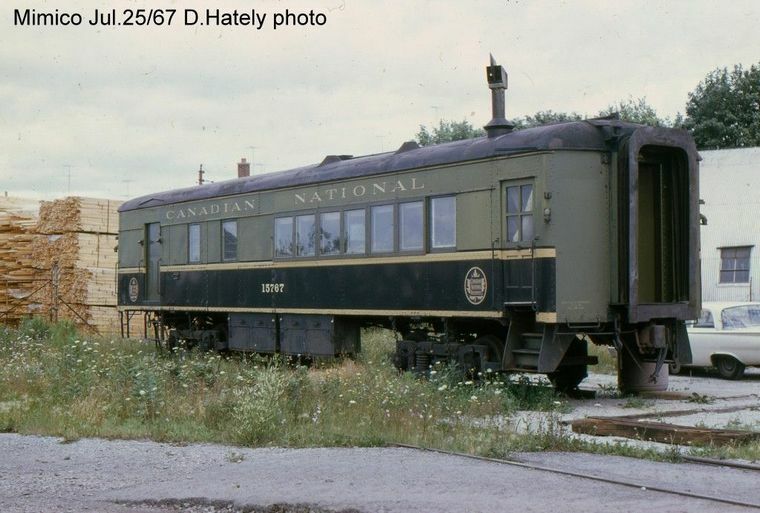 Preserved at Exporail. NOTE: Last runs of 603 and 604 were on Saturday October 25, 1958 with Pacific 5292, mail & express 7732 and coaches 5170 and 5196. 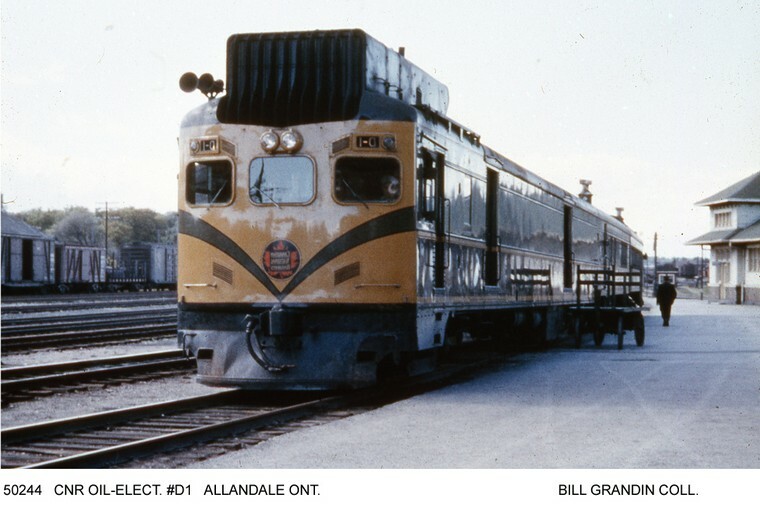 15832 had been transferred to relieve D-1 on the Hamilton-Georgetown-Allandale-Meaford run. 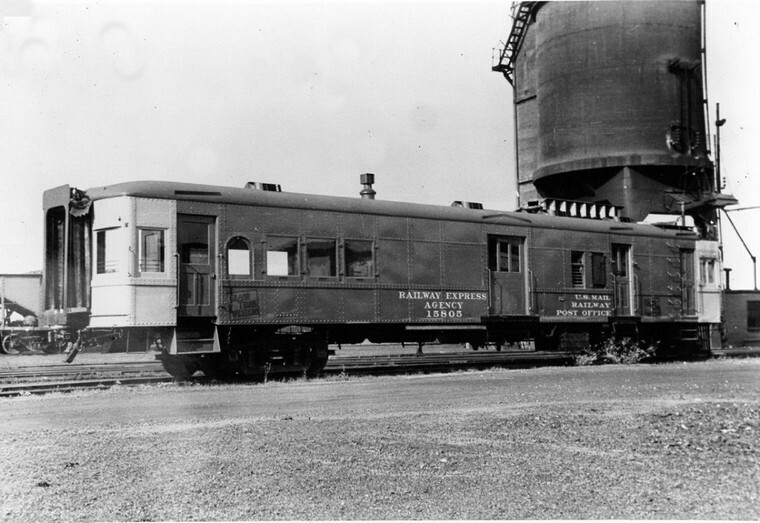 This rebuilt streamlined motor car was a prototype for updating self-propelled motor cars to present a modern look. It was the only one the public got to see. No further conversions were undertaken by CNR. 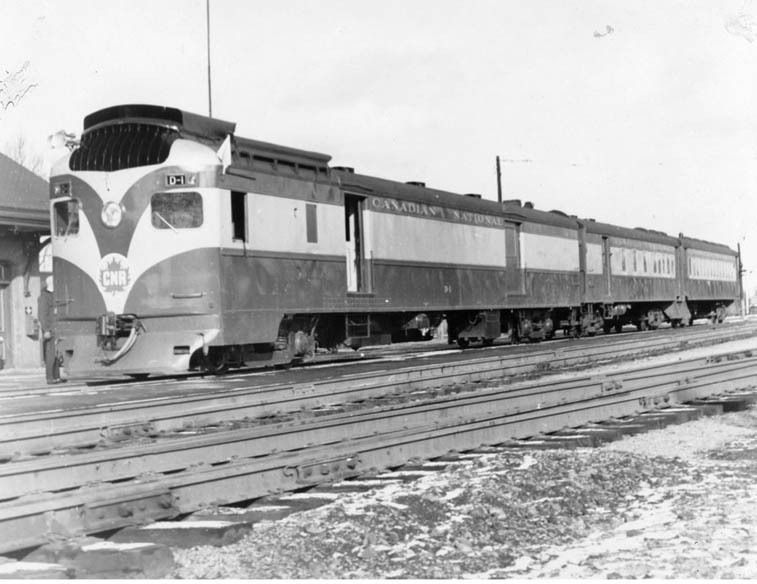 This streamlined front put a modernized look to the train set complete with unique numbers. Certainly better than the usual ugly look of these cars! It was to be the only such conversion. 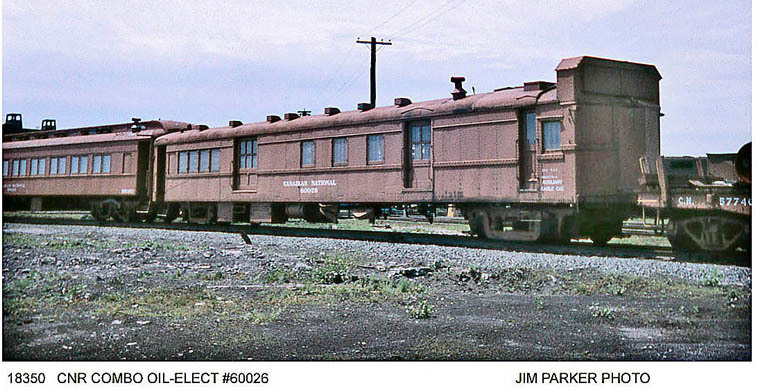 By this time modern Budd Rail Diesel Cars were coming. 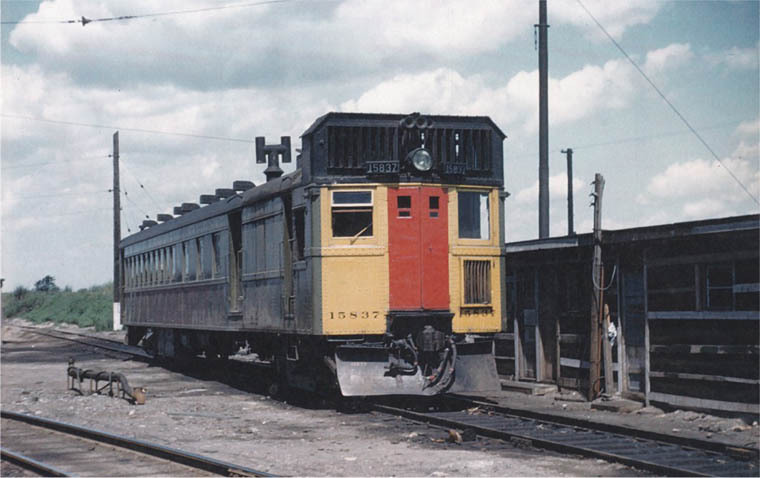 D-1 rebuilt PSC October 1951 (ex 15834) as powered baggage car with two trailer cars. Caterpillar D-397 12 cyl.diesel. C-1 (ex 15742) combination RPO coach trailer seating 14 passengers. 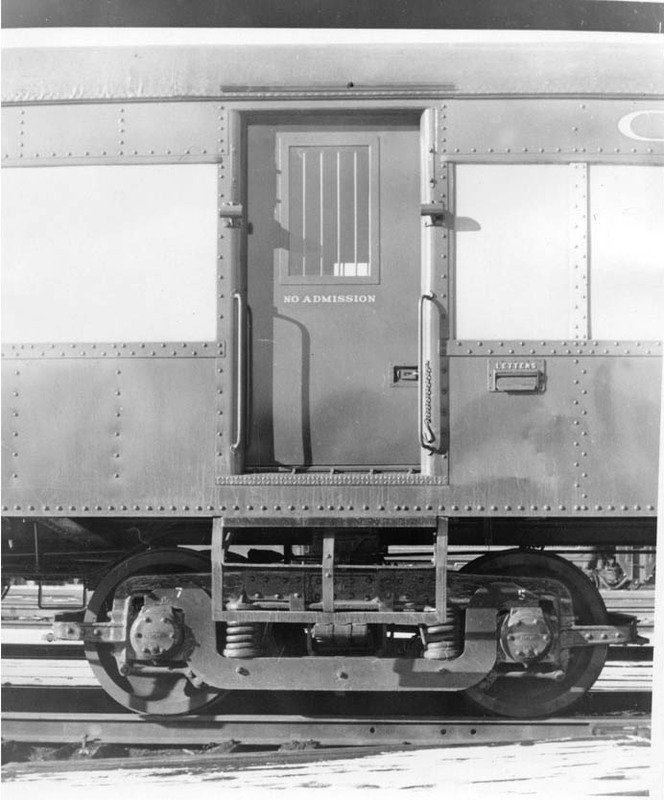 C-1 RPO door. Note letter slot for public to post mail. 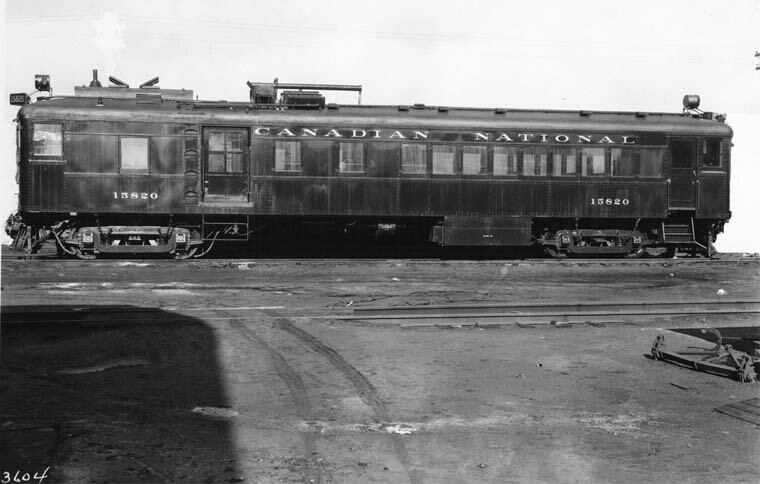 Transferred to CNR September 1939. Not used. Scrapped Val Royal, Que. December 1948. 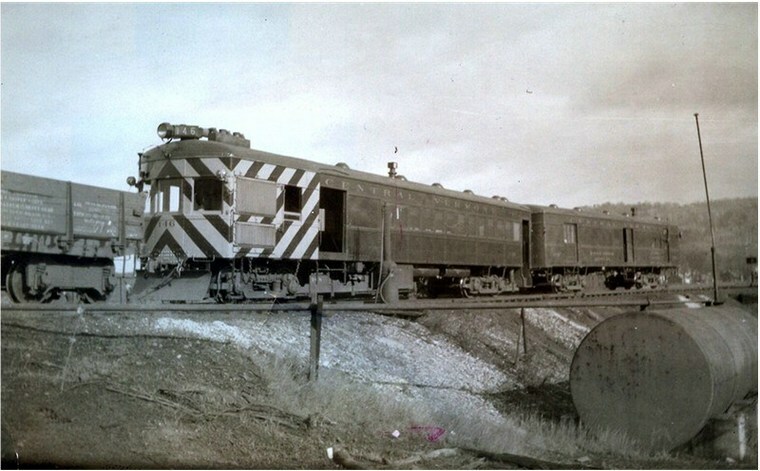 GTW 15805 EMC August 1925 R/B July 1941 Caterpillar diesel. Sold as truck 1942 to Dept. Munitions and Supply, Canada. 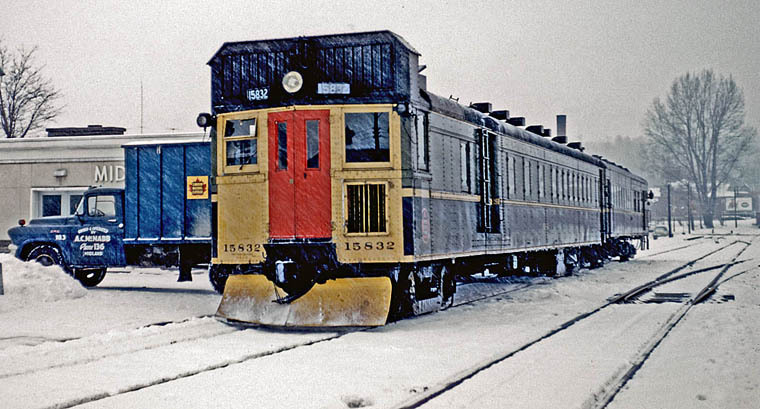 Note: Three 25 seat passenger units 15951-15953 were built in 1937 by Evans Products Corp. Detroit. Equipped with 6 cylinder, 100 horsepower REO Gold Crown gas engine. and after crossing border, by rail on NS&T to Port Dalhousie. 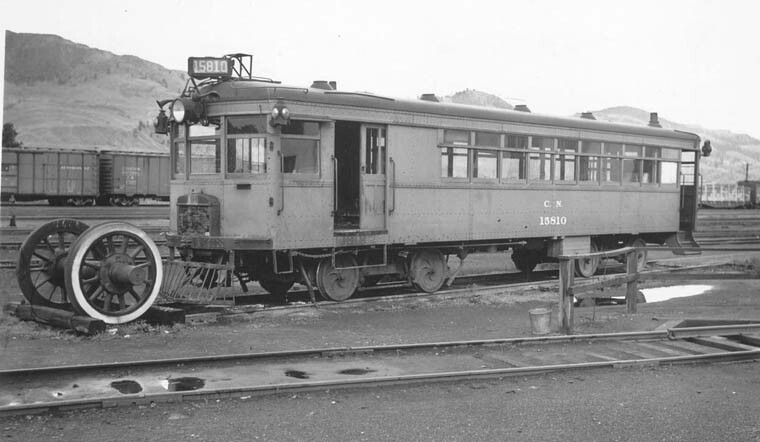 Removed rail wheels in 1938 due to mechanical problems and used as buses. 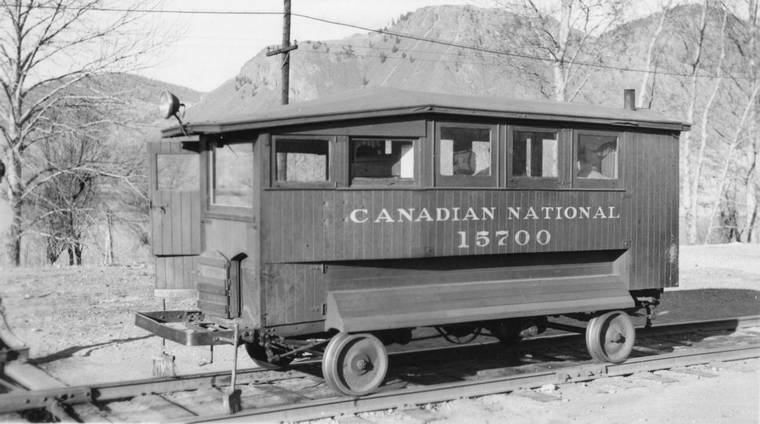 15951 and 15952 repainted Canadian National Transportation Ltd. in 1941. 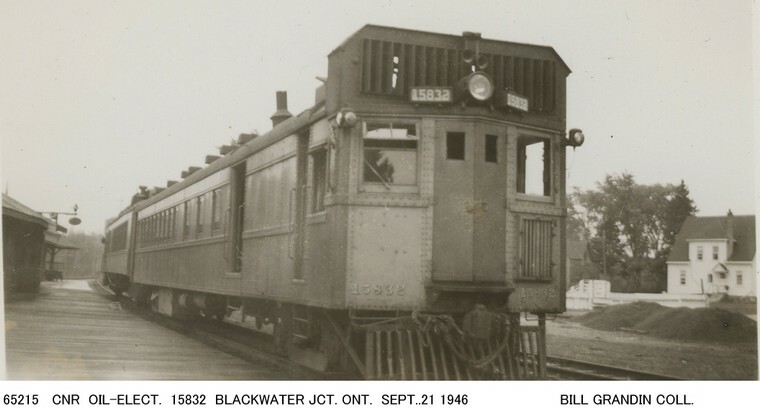 Transferred 1942 to Oshawa Railway for use as buses.